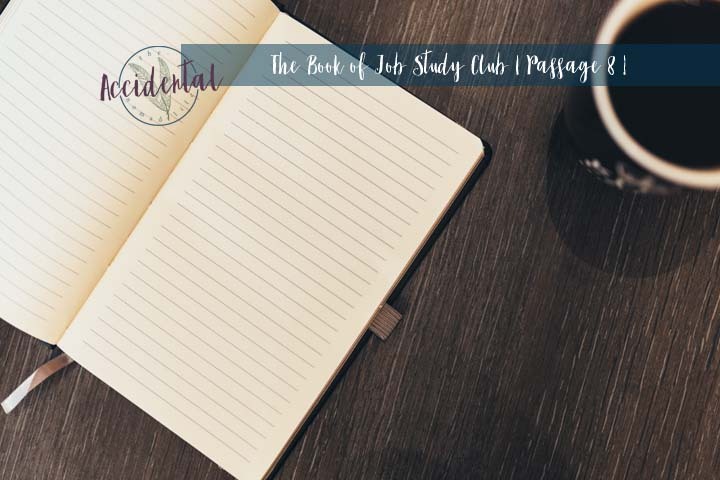 There are several ways to look at the passages today, you can come openly, willing to see what Job is learning, trying to say, and understanding what God REALLY is doing in the midst of this crisis. You can come, ready to throw blame on Job for being such a winy baby, or you can come ready to blame God, agree with Job and argue that God is just mean in this case. Why can Job praise God's might and then wonder where God is? It's easy to talk about how good God is and forget, all in the same instance when our eyes are being drawn to our circumstances. Job spent so long in mourning, I think he forgot to come back and praise God for what God CAN do. I don't blame Job for mourning, he lost EVERYTHING, but I think what would have helped him, is to remember what his wife challenged him with in chapter 4, "Is not your fear of God your confidence and the integrity of your ways your hope?" He seems to have completely forgotten that as his friends are trying to encourage him. Why is Job fluctuating between a prideful arrogance, and blaming God, to feeling pity for himself? I think it comes down to how much time he spent mourning, versus how much time he spent, reflecting on the true goodness of God. He began trying to defend himself to his friends, not realizing that they are working to support him and uplift him to remembering God's goodness. The enemy wants us to forget God's goodness, and Job was no exception. Can God truly be the CAUSE of all of Job's pain? No. Plain and simple. Just, no. It's not possible. God is a good God. Sure, he can inflict pain and sadness on people - he IS all powerful, but he WON'T. He has said that he is Love and everything that he says is true. 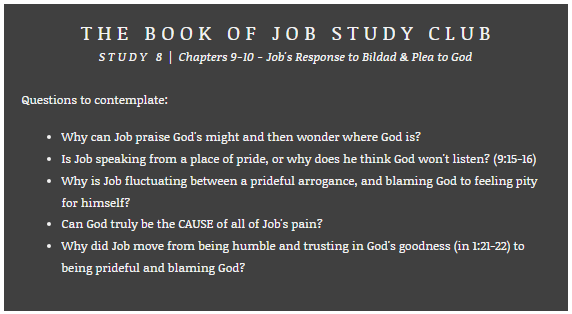 Why did Job move from being humble and trusting in God's goodness (in 1:21-22) to being prideful and blaming God? I guess this is kind of the same question as above, but it shows, that he is TRYING to remember God's goodness, and mercy, but he can't get over his own pain enough to humble himself to God. I can definitely resonate with the struggle that Job is going through from the focus on earthly pains and sorrows, to remembering that God is good and uses all things for good. I can't wait to continue on and find out how the book ends (I've never read to the end before!!! ).